Folks, if you are working or actively participate in video field production or documentary films, you should have read Anthony Q. Artis’s “Shut Up And Shoot – Documentary Guide". It’s a filmmaking guide book to teach you how to create professional video packages with limited resources, it also talks about some common mistakes in making videos. I think it’s more like a user-friendly guide book rather than a boring, thousand-page-manual or textbook or something like that. It’s a highly recommended book for all documentary filmmakers. Indeed, this book has been adopted as a textbook for many film schools and colleges. About 6 years ago, Anthony had another user-friendly guide book for freelance videographers, it’s called “Shut Up And Shoot – Freelance Video Guide". This book is considered as an addition or supplement to the “Shut Up And Shoot – Documentary Guide", more than that, this book tells you how to create good marketing videos, music videos, and live event videos, etc. The book also provides step-by-step guidance on planning, shooting, lighting and recording the most common freelance video projects. On the other hand, it covers production strategies and how to deal with your clients. Everything is in that one book, I bought this book and I’m very honored to have Anthony’s autograph just before I moved to Macau. If you are interested to be a freelance videographer, or you are currently working as a videographer and wish to learn how to make different kinds of videos, “Shut Up And Shoot – Freelance Video Guide" is just for you. Then I think it was about 2014, (correct me if I’m wrong) Anthony has updated his first “Shut Up And Shoot" series, which is “Shut Up And Shoot – Documentary Guide (Second Edition)". Unfortunately, I have been in Macau, and I had no way to get it in Macau since the book is not sold overseas. Luckily, I have my friends in Macau who recently traveled to US for their honeymoon to have this newest “Shut Up And Shoot" book for me. When I first got this book last night, I felt excited about what the book covers, this new book doesn’t only cover step-by-step guidance on documentary and freelance filmmaking, like planning, shooting, lighting, etc., but it also covers the most updated about DSLR cameras, new lighting gear, visual storytelling, post-production techniques and hiring professional crews. Even more than that, the book also covers new sections on fundraising, 4k format, shooting on iPhone, just to name a few. This new book, along with Anthony’s two previous books, is my best companion as a freelance videographer. Therefore, I strongly recommend everyone who is interested in filmmaking to have these three books. Trust me, this is the best filmmaking book I ever had. Folks, if you are working or actively participate in video field production or documentary films, you should have read Anthony Q. Artis’s “Shut Up And Shoot – Documentary Guide". It’s a filmmaking guide book to teach you how to create professional video packages with limited resources, it also talks about some common mistakes in making videos. I think it’s more like a user-friendly guide book rather than a boring, thousand-page-manual or textbook or something like that. It’s a highly recommended book for all beginning documentary filmmakers. Indeed, this book has been adopted as a textbook for many film schools and colleges. Now, Anthony Q. Artis has a new user-friendly guide book for freelance videographers like me, it’s called “Shut Up And Shoot – Freelance Video Guide". According to their website, this new book is considered as an addition or supplement to the “Shut Up And Shoot – Documentary" guide that I mentioned before, more than that, it tells you how to create good marketing videos, music videos, (I wish I could learn this!) and live event videos, etc. The book also provides step-by-step guidance on planning, shooting, lighting and recording the most common freelance video projects. On the other hand, it covers production strategies and how to deal with your clients. Everything is in that one book. 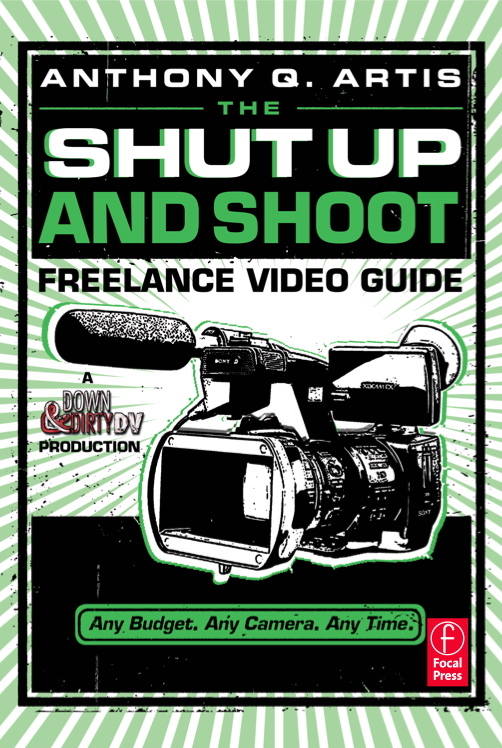 “Shut Up And Shoot – Freelance Video Guide" is now available for online pre-order, you can get this 400-page, full-color, user-friendly guide book for just $27.99 plus shipping charges. This is a pre-order discount offer, and all the books will be shipped on December 14. If you are interested to be a freelance videographer, or you are currently working as a videographer and wish to learn how to make different kinds of videos, this book is for you. I’m sure you’ll be benefited a lot. 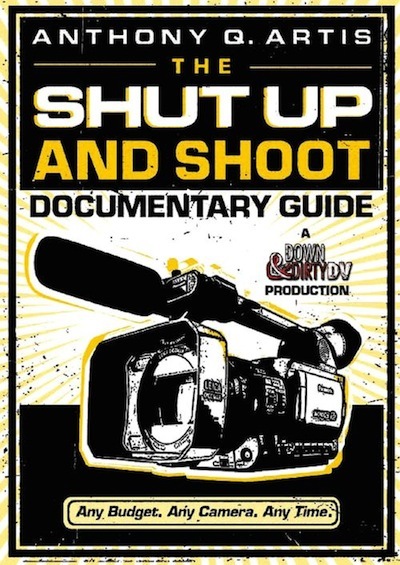 Again, the “Shut Up And Shoot – Freelance Video Guide" is available for pre-order, you can now make it at their website: http://downanddirtydv.com/products/the-shut-up-and-shoot-freelance-video-guide/. For more details about the book, you can also check out that website.